I made a batch of these rich brownies last week-end and I will be making another tomorrow: they are the perfect gooey, fudgy and moist brownies ever… I had tried several other recipes over the years but this one is definitely the best. It comes courtesy of Ms Hepburn – via The Week– and they certainly have the star quality I was looking for. They taste as good as the delicious brownies we love to order with the film at the delightfully retro Electric cinema in Portobello. We love going as a family to sprawl on the gorgeous leather sofas while watching the latest French film – The Artist was our last one. Their wonderful brownies are a large part of the attraction and help make the outing that little bit more special. 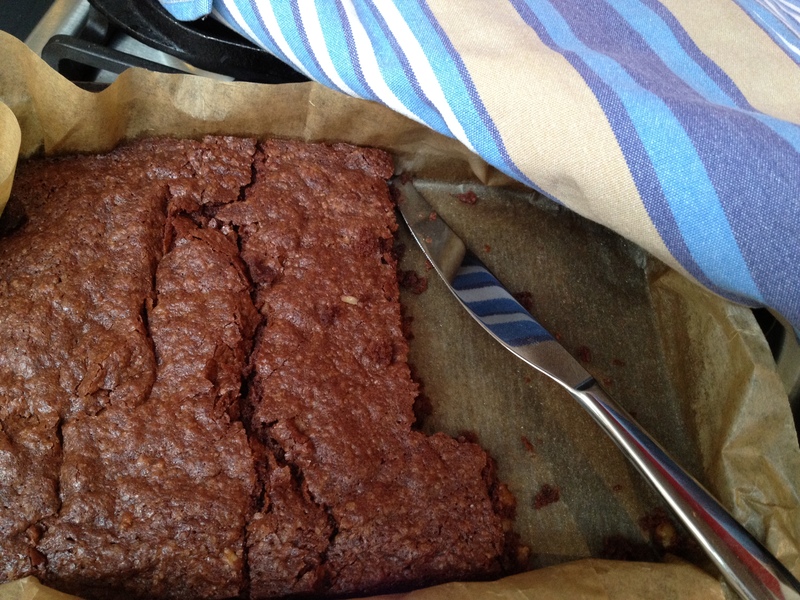 But back to the recipe – do not be afraid (as I was) as regard to the amount of sugar because that is the reason for the fudgy texture and slightly toffee flavour… Best not to skimp on that then. I took The Week version with the above changes and it was heavenly. Darker and less oily than the original. Apparently close to the Cranks Bible recipe. Melt the butter with the chocolate in a saucepan on low heat and remove before it is totally melted so you don’t get the chocolate too hot as it instantly looses its flavour and texture. I used a Guanaja 70% by Valrona. Add the beaten eggs, sugar and two drops of vanilla essence. I used light brown Demerara sugar to enhance the toffee hints. 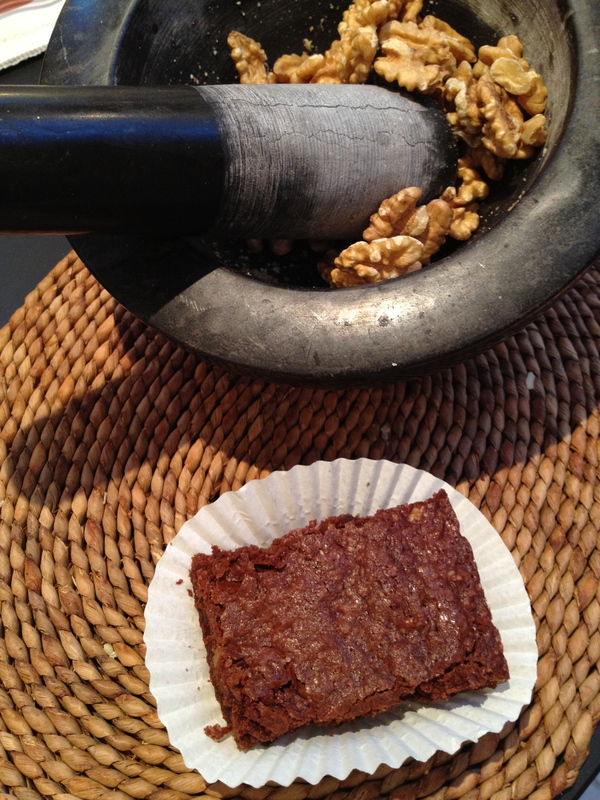 Add a pinch of salt and the chopped walnuts – I use a pestle for a rough crumble. Add the flour through a sieve and mix well. Pour out in a square cake tin lined with baking paper and bake for 20 to 30 minutes, depending on your oven. They come out a bit wrinkly and still quite soft and will set on cooling but keeping their moist and fudgy, irresistible texture. A great find! Now enjoy and do follow Katharine Hepburn advice: “Never quit, be yourself, and don’t put too much flour in your brownies”. This entry was posted in family favourite. Bookmark the permalink. J’avais vu cette recette sur The Week et je voulais la tester justement! Merci Diane! Ms Hepburn clearly knew her brownies (love the quote)! These look gorgeous. She did indeed and her brownies are as just what brownies dream to be! Some of the best brownies I’ve ever had! Congratulations to mum and daughter from the UCL Institute for Women’s Health!!! Thank you Riccardo, they were made by Eleonor with care and love and that always tastes better than anything! Glad you all enjoyed them.